The end of the 1955 model year left Chevrolet executives questioning the direction in which they should take the Corvette. After all, they had addressed the issue of performance by introducing the small block V-8 engine and a 3-speed manual transmission as options for consumers to include in their cars. Still, Corvette’s sales were far from the expectations that GM required to consider a car successful in the marketplace. While some critics of the car were already reporting that the Corvette’s demise was imminent, the reality of the situation was considerably different. One of General Motors biggest competitors (and arch enemies) had launched a car campaign that seriously threatened Corvette’s corner on the marketplace. The Ford Thunderbird had met with resounding success, taking a firm foothold in the car market and proving without question that a car manufacturer could succeed by marketing a two seat sports car (although Ford chose to refer to the Thunderbird as a “personal” car, thereby avoiding the criticism that cars like the Corvette received from racing/performance car purists). 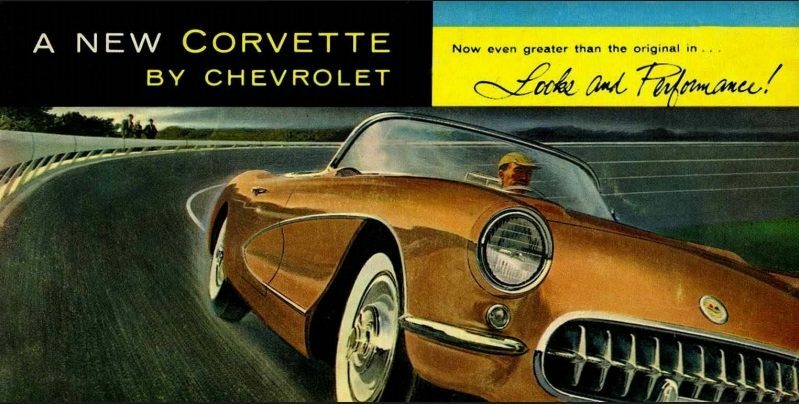 It was clear that the Corvette, for better or worse, was going to be Chevrolet’s best shot at competing with the Thunderbird, but they also knew that, despite it’s recent mechanical improvements, it required a makeover – both cosmetic and functional – to truly become a world class contender. Truth be told, the 1953–55 Corvette was neither a serious performance sports car nor a small, fun-to-drive roadster that anyone could afford. Instead, it had gained a reputation as being an overpriced “image” car, though many questioned what that image was supposed to project. In addition, the car was prohibitively expensive. 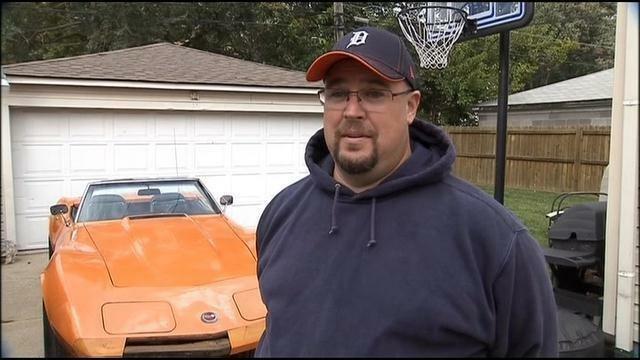 With a price tag of approximately $3500.00, a Corvette cost nearly twice as much as a typical family sedan. As the 1956 model year approached, all of these items were brought into question. 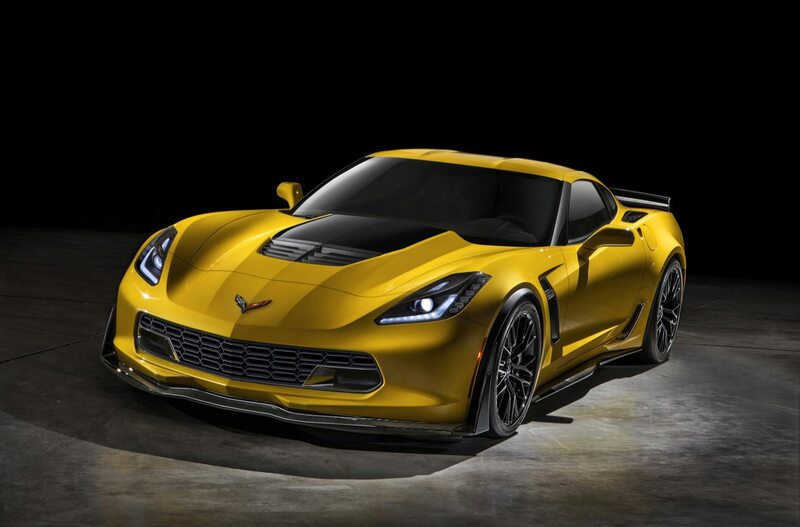 What could Chevrolet do to make the Corvette more appealing? 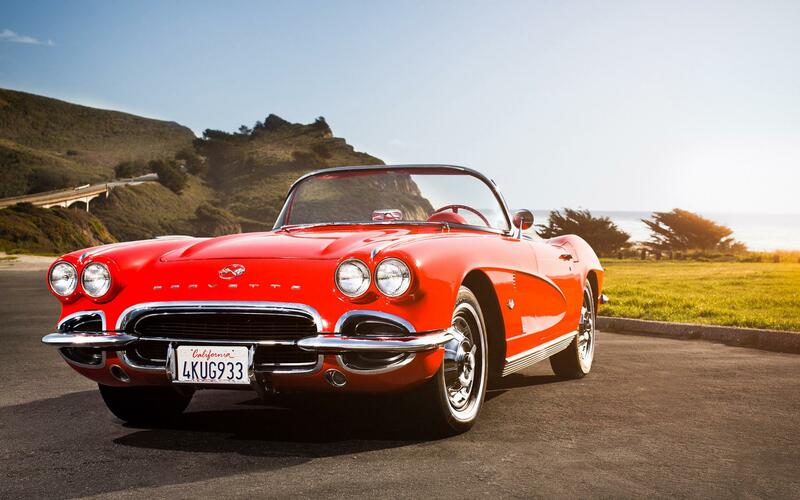 What would it take to make the Corvette superior to the Ford Thunderbird in every aspect? 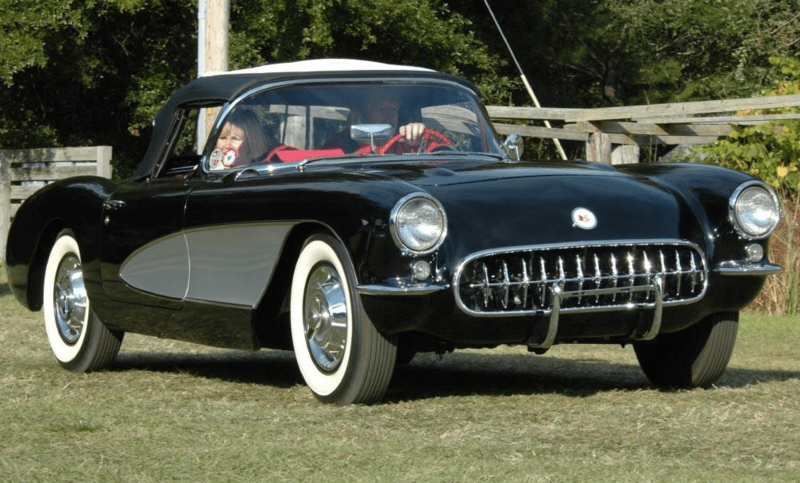 As the Thunderbird had outsold the 1955 Corvette at a ratio of 23-1, this was a challenge that Chevrolet was prepared to commit their best resources to, ensuring that Corvette would never again fall so short of the competition. Harley Earl, who had been taking the many public criticisms about the Corvette to heart, dove headlong into the process of addressing them. 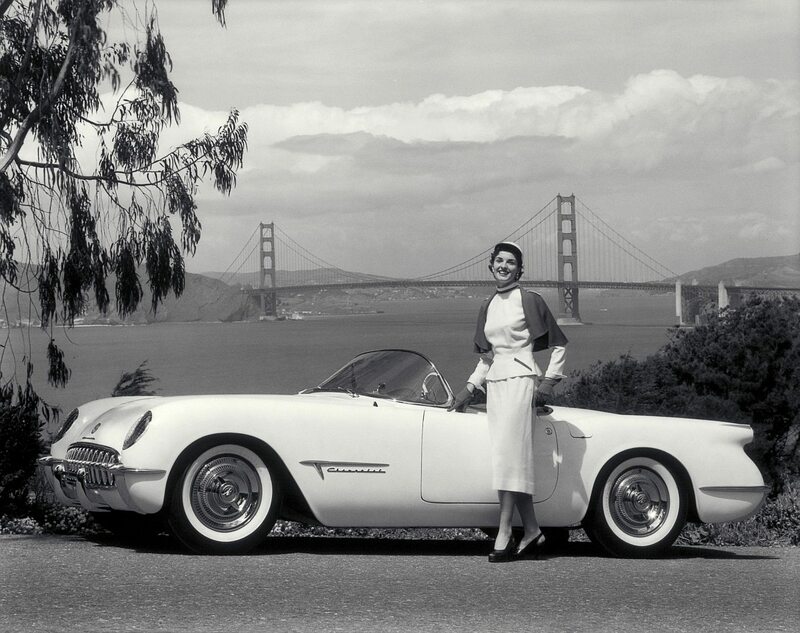 The 1956 Corvette Unveiled (Image Courtesy of GM Media). On February 1, 1955, just as the Ford Thunderbirds were beginning to make an appearance on the streets in serious numbers, Earl had all but finalized a full scale clay model of a new Corvette body. By Mid-April, having made a number of minor trim changes, Earl approached General Motors management with his model and, upon inspection, the new design was approved on the spot. 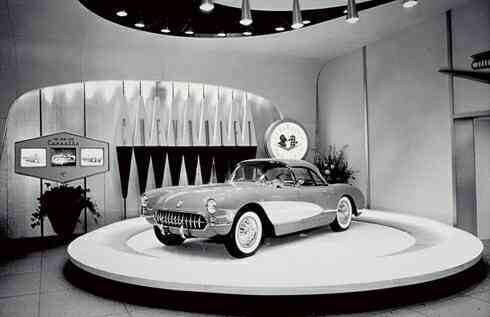 The results of his new design was a 1956 Model Corvette that would change the direction of Corvette sales for all time. This “second-generation” styling was based on three concept cars that appeared at the 1955 Motorama: The Chevrolet Biscayne and a pair of showstoppers dubbed “LaSalle II”. The Biscayne was a compact four-door hardtop with features that included “bugeye” headlamps that were set high and inboard of fender mounted parking lights, a grill that was made up of a series of vertical bars, shallow air-intake slots that were positioned in the cowl just ahead of and below a huge compound-curve windshield, and a flat bottom floor that was level with the bottom of the frame. DID YOU KNOW: One of the few ways to differentiate between a 1956 and a 1957 Corvette without opening the hood is to look at the inside rear view mirror. On the 1956 Corvette model, the mirror adjusts with a thumbscrew, whereas on the 1957, the rear view mirror adjustment requires a wrench to loosen the locknut. The LaSalle II was a similar styled hardtop sedan and sporty roadster combo; both versions had prominent vertical-bar grilles as well but sported a styling touch the 1956 Corvette would inherit; an elliptical concave section at the rear of the lower bodysides that was swept back from the front wheel wells. These areas would come to be known as “coves” and would eventually be recognized as signature trademarks of the Corvette. The bodyside “coves” gave the 1956 Corvette a truly unique styling personality. 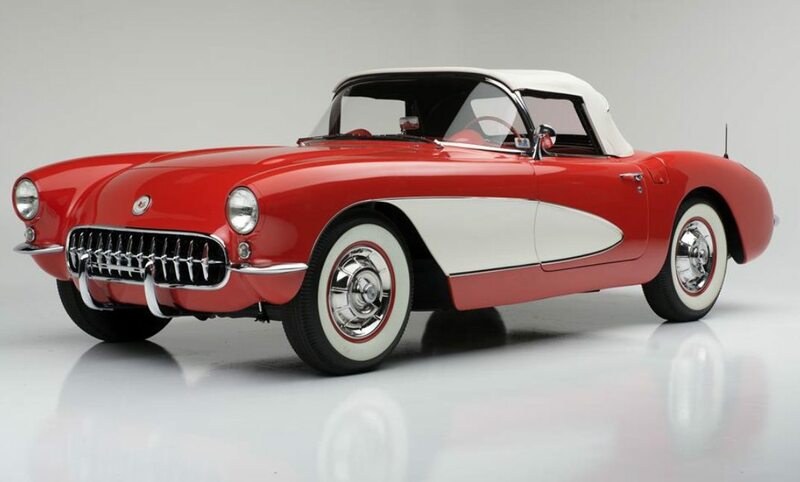 While the body stylings of the 1953–1955 Corvette had led the car to become mockingly called “the plastic bathtub”, this new look helped to correct the long, blocky look of the original ‘Vettes and gave the new design an aggressive look and flow that was clean and attractive. To further accentuate the overall styling of the car, the coves were outlined in chrome and were often painted a different color than the rest of the car. 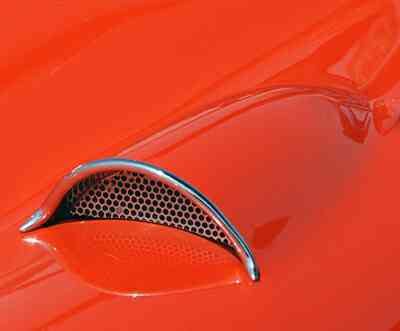 On the 1953-1955 Corvette, the front end or “face” of these cars was considered to be it’s most appealing element. 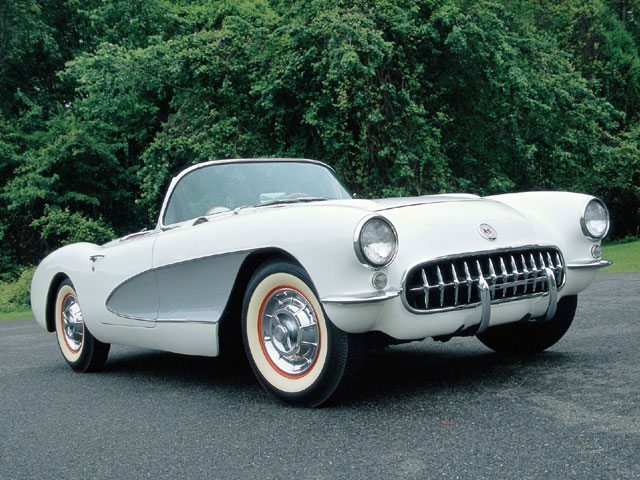 Many criticisms of the first generation C1 was that the headlight screens gave the Corvette’s face a veiled look, which was considered inappropriate for a “man’s” car. The 1956 Corvette design corrected this issue by bringing the headlights forward and uncovering them. Complimenting this was a larger version of the round Corvette nose emblem, featuring the crossed-flags motif that continues to survive today. The grill, or “mouth” would remain unchanged for the 1956 model. Rear end styling revisions to the Corvette were also performed. The 1953-1955 fenders and jet-pod tail lamps were minimized to more attractive French curves contoured to match the rear deck curvature. New taillights were neatly added above a vertical bumperette on each fender. The trunklid “shadow box” was discarded and the license plate was moved to below the trunk opening. In all, the result was a smooth, gently curved backend with slightly protruding fenders. The new Corvette was now largely devoid of any styling gimmicks, though two obvious one remained: there were still two faux vent scoops atop the front fenders near the windshield and the car still continued to include the often-criticized wheel-knockoff hub covers (hubcaps). These hub covers would remain a standard featured on the Corvette until the 1963 model year. Ironically, the hubcaps have become known as some of the best covers in automotive history. Finally, the Corvette had begun to come into it’s own both stylistically and functionally. Gone forever were the awkward and disliked side curtains of the 1953-55 models, replaced forevermore by roll up glass windows. Chevrolet even went so far as to offer automatic roll-up windows as an option (for an additional cost.) 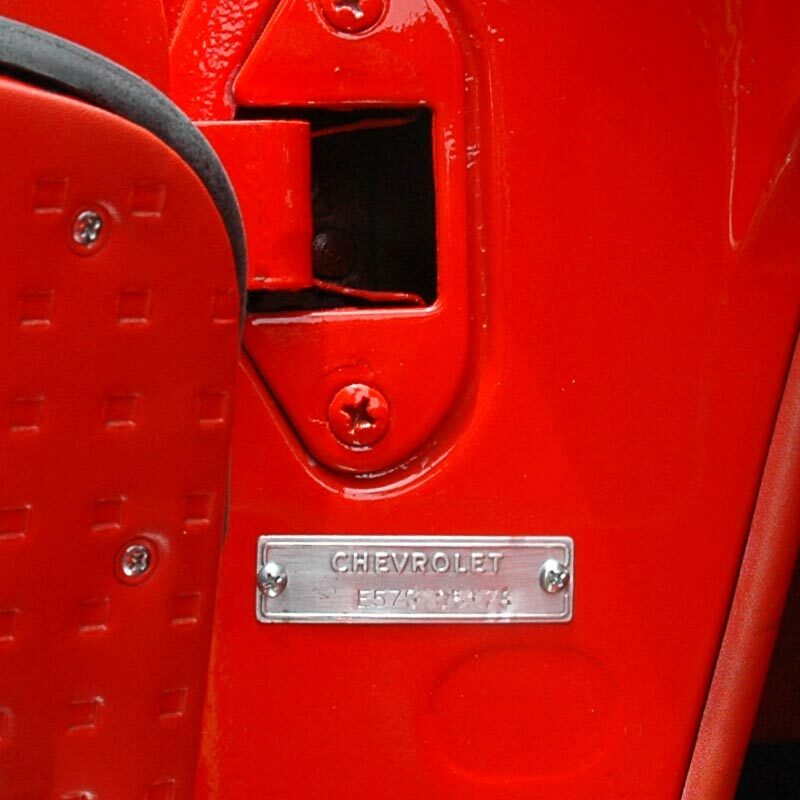 Outside door handles were also included in the redesigned door, allowing Corvette owners the ability to open the door without having to reach into the car to do so. The optional hardtop was made available in 1956 for an extra $215.20. (Image Courtesy of GM Media). The car’s standard convertible top was improved upon, now providing a tighter fit that virtually eliminated leaks. It was also offered for the first time in beige and white in addition to the standard-issue black cloth top. A power-operated convertible top was offered for the first time as an option (at a cost of $170.60). While the top was technically only partially automatic – it required the operator to first unlatch and partially collapse the top before activating the fold button – it was still a remarkable improvement over the original convertible tops of the earlier models. Better still was the optional hardtop that was originally modeled on the production-based prototype seen at the 1954 Autorama Show. This hardtop was also a factory option available to consumers for an additional $215.20 (although it could be swapped for the factory soft top at no additional charge). One of the greatest benefits of the optional hardtop was that it offered superior visibility when compared to the factory soft top. Little changed on the interior of the car itself from the 1955 model. The car retained the existing “twin cowl” dashboard with it’s awkward, full-width instrument panel. A new spring-stroke steering wheel was included in the interior re-design as well a new waffle-pattern upholstery and revised door panels to go with the wind-up windows. The car’s heater was changed from a recirculating variety to a new “fresh air” version after the first 145 production cars were built. A transistorized signal-seek radio was also offered as an option (for an additional $198.90). Seatbelts were also offered for the first time as a dealer installed accessory kit. 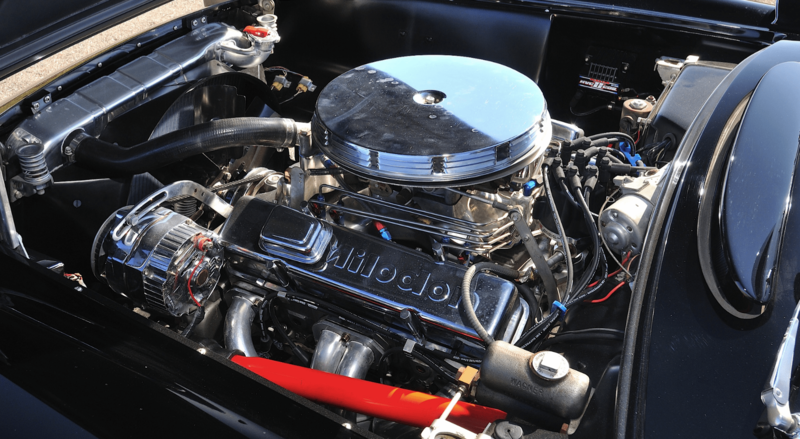 From a performance base, the new, small block V-8 that had made it’s first appearance in the 1955 Corvette as an option was now standard for 1956. The small block contained more muscle than before and now featured a rated 210 bhp at 5200 rpm. The car now featured a single, four barrel carburetor and higher 9.25:1 compression. 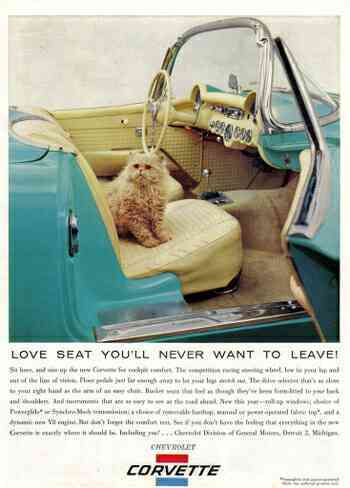 Chevy Advertisement for the 1956 Corvette titled “Love Seat You’ll Never Want To Leave”. 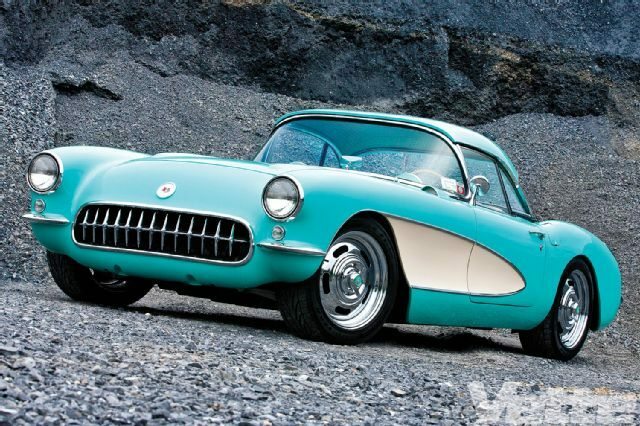 Indeed, the 1956 really saw the beginning of America’s love affair with Corvette! Considering that just three years earlier, the Corvette was producing a mere 155 bhp, this was a considerable improvement. A special high lift camshaft was made available as an option for an additional $188.30, but was only available in tandem with the optional 225-bhp dual four-barrel carburetor equipped engine for another $172.20. Chevy recommended this combination for “racing purposes only” . It was said that, when running on premium fuel, this engine could produce around 240 bhp. It was clear by these impressive improvements that the “Blue Flame” six cylinder was gone for good – and few were sad to see her go. Like the small block V-8 engine, the 3 speed transmission was also standard in 1956. In a “role reversal”, the Powerglide 2 speed became the optional transmission for an additional $189.00. The manual transmission was tweaked with much closer gear ratios than in the 1955 version. 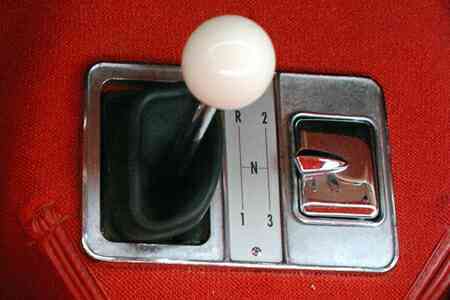 In addition, the shifter was now attached directly to the transmission housing, which allowed for more positive shifts. A stronger clutch was added and the rear differential was also new for 1956. 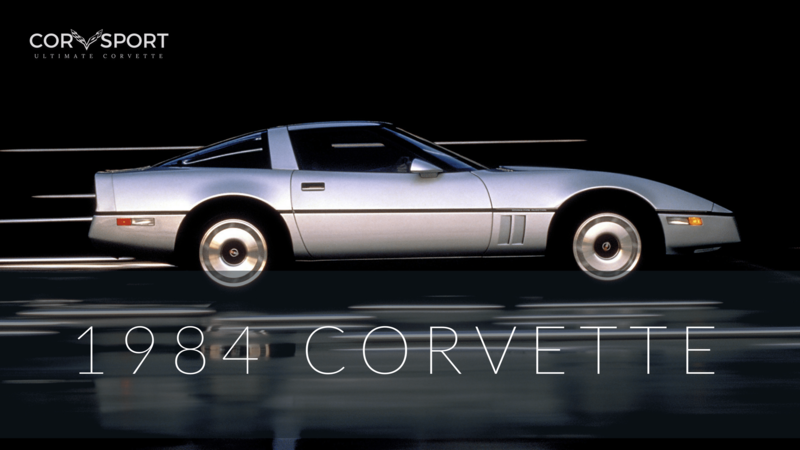 Finally, Corvette began to emerge with growing acceptance from both consumers and critics alike. The consensus was that Chevrolet had finally presented a Corvette that was no longer “half finished” but rather offered genuine sports car performance with smart new styling and a full compliment of options and amenities. Enthusiast magazines generally praised the new Corvette, stating that it’s manual shifter was race worthy and that the car’s handling was “good to excellent compared to other cars in it’s class” though it was identified that the car did have a tendency to under steer. The steering gear itself provided for quick and accurate steering – just 3.5 turns from lock to lock. Even weight distribution was close to perfect with a 52/48 percent distribution front/rear. The one remaining problem that continued to present a challenge to the Corvette was that of brake fade. This single weak point did little to detract from the overall positive image this new Corvette portrayed, although testers did note that they “faded into oblivion” during hard braking conditions. In all, the critics agreed that the car offered greatly improved road behavior despite the fairly harsh, but controlled, ride. Duntov’s addition to the Corvette family leads to Corvette’s direct involvement not only as a production car, but as a race car too! (Image courtesy of GM Media). Finally, there was no doubt that the true American sports car had come of age While productions numbers were still down from where GM would have hoped they would be, a total of 3,467 Corvettes rolled off the line that year, re-affirming to those within the General Motors family who doubted that the Corvette could ever be made commercially viable that this car was finally on it’s way – and prepared to do battle for the business that was currently being given to the Ford Thunderbird line. 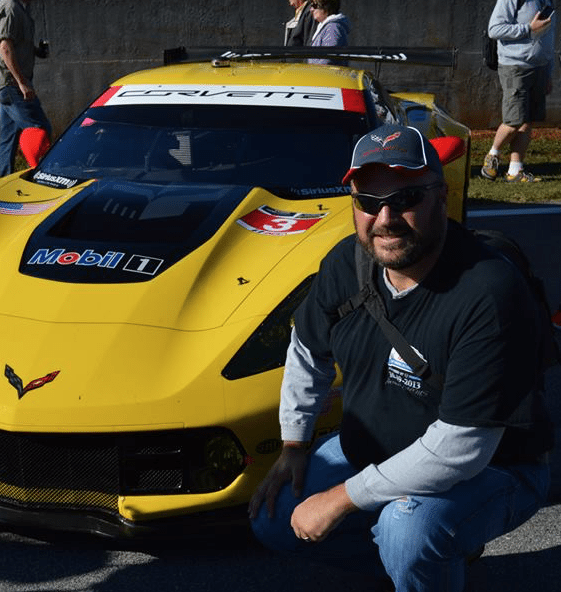 Interestingly, in order to make the Corvette more commercially viable, members of the Corvette engineering and design teams began looking at other ways that they could utilize this car. Afterall, having a sports car was of little value if you couldn’t truly use it for sport. Nobody knew this better than Zora Arkus-Duntov, as he had once been a respected and accomplished race car driver during the early years of his career. 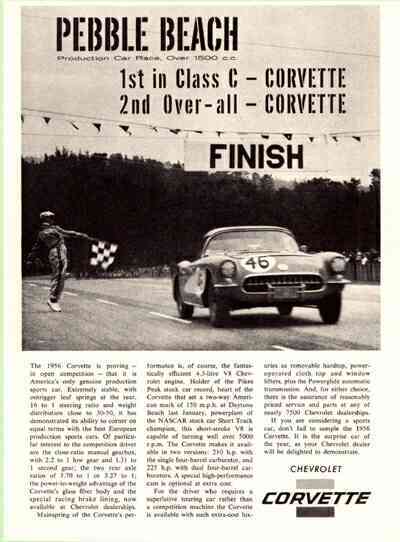 Duntov believed that having a race winning image was vital to the success of the Corvette. Duntov had developed a high lift camshaft specifically for the intent of making the Corvette a contender in racing circuits. He believed that if the Corvette could set a few speed records and win some races, Chevrolet would be able to capitalize on these feats and thereby further promote their newly improved sports car. GM gave Duntov the “green light” to proceed with his plan and the Duntov camshaft was placed into a modified 1956 model Corvette that had been specifically prepared at GM’s Arizona proving grounds. Front Tires: 6.70 x 15 inch, 24 psi. Rear Tires: 6.70 x 15 inch, 24 psi. Front: Independent; upper and lower A-arms, coil springs, antiroll bar, tubular hydraulic shock absorbers. 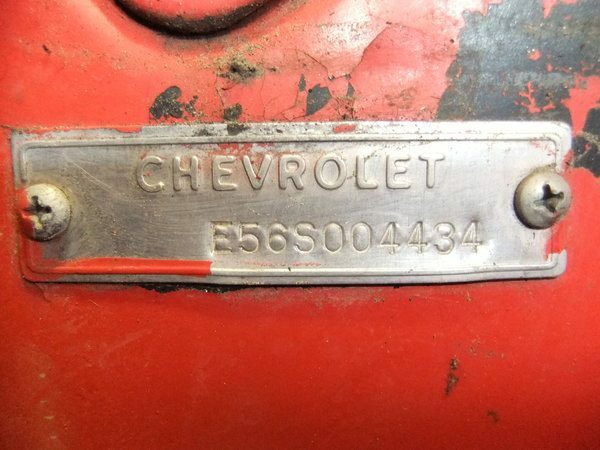 E (First Digit) General Motors Identification Code for Chevy Corvette. S (Fourth Digit) Location of the Assembly Plant. S – St. Louis, Missouri. The last three digits begin at 1001 and run thru 4,467, accounting for each of the 3,467 Corvettes built in 1956. Each Vehicle Identification Number (VIN) is unique to an individual car. 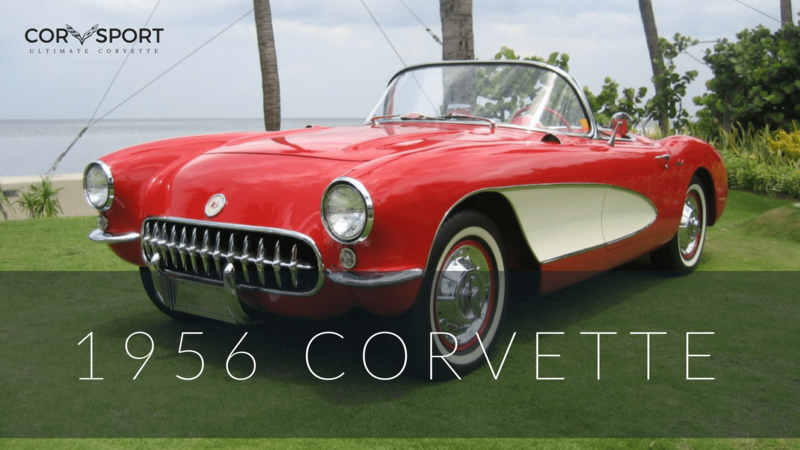 For all 1956 Corvettes, the location of the Vehicle Identification Number (VIN) is located on the driver side door post. The VIN is also stamped on several locations on the Corvette frame. 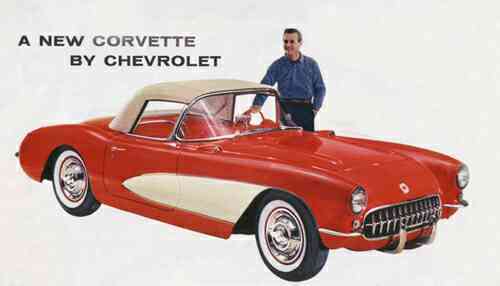 The base price of the 1956 Chevrolet Corvette without any optional equipment. This base option price included a 265 cubic inch, 210 horsepower V8 engine, 3-speed manual transmission, vinyl interior trim, and a soft top. 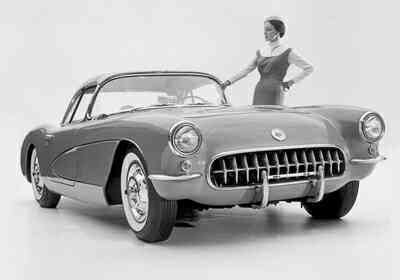 The Corvette heater was changed from a recirculating-air-only type to a new “outside” fresh air design in 1956. 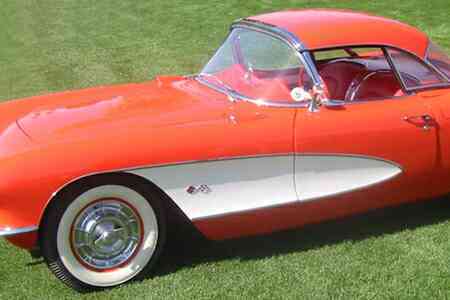 The first one hundred forty five 1956 Corvettes were built with the old type, “recirculating” heater. A standard Delco, signal seeking AM radio with conventional volume and tuning dials. The AM Radios for the 1956 Corvette were transistorized – another first for the Corvette. Most 1956 selector bars for the signal-seeking feature were plain. Models not equipped with this option received a painted block-out cover plate. A warning light that illuminates/ indicates when the parking brake is applied. Interior lights mounted on the interior of the car to aid in visibility when outside lighting is unavailable. A washer pump and dispensing nozzle mechanism that dispenses cleaner onto the windshield. The windshield washer reservoir for the 1956 model was a blue bag made of vinyl and vinyl-impregnated cloth. It was pseudo-transparent for viewing of the washer fluid level. It attached to the left inner fender. Original tires were either U.S. Royal Air Ride, B.G. Goodrich Silvertown or Firestone Deluxe Champion. All tires were wide-whitewall type, with whitewall widths varying from 2.5 to 3 inches. An “optional” two-speed automatic transmission developed by GM. An optional hard-top that replaced the standard convertible top. Although the Auxiliary Hardtop is shown as an option, customers could swap the convertible top for the auxiliary hardtop at no additional cost. Of the 2,076 Corvettes sold with this option, 629 of them were the result of this substitution. 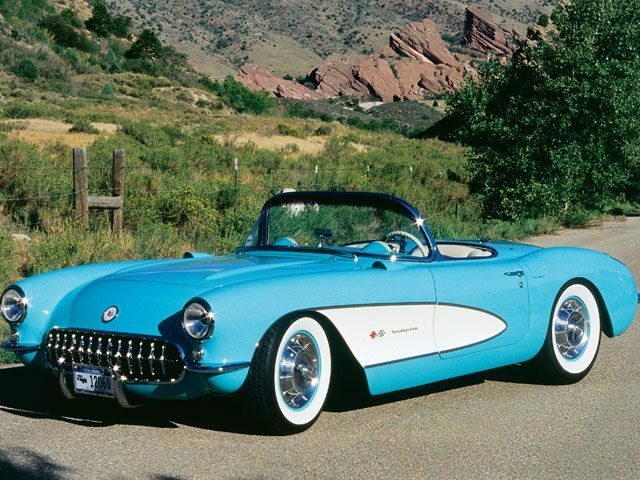 1956 was the first year that a factory auxiliary hard top was made available for the Corvette. The anodized header trim made the 1956 auxiliary hard tops unique to the year. However, the header trim was painted the same color as the top on early 1956 models. Electronically controlled windows which could be raised or lowered during vehicle operation. A second, optional paint color that was used to highlight the bodyside coves. When ordering paint colors, the code “std” denoted a black exterior. All other exteriors, including two tones, were denoted by the code “440” followed by one alpha character. Solid colors were identified by the letters R through X (the letter U was not used.) Two tone paint schemes were identified by the letters A through G.
A total of 1,259 Corvettes featured the two-tone paint scheme in 1956. Of these, 223 were painted Onyx Black/Silver, 166 were painted Aztec Copper/Beige, 147 were painted Cascade Green/Beige, 172 were painted Arctic Blue/Silver, 431 were painted Venetian Red/Beige, and 120 were painted Polo White/Silver. 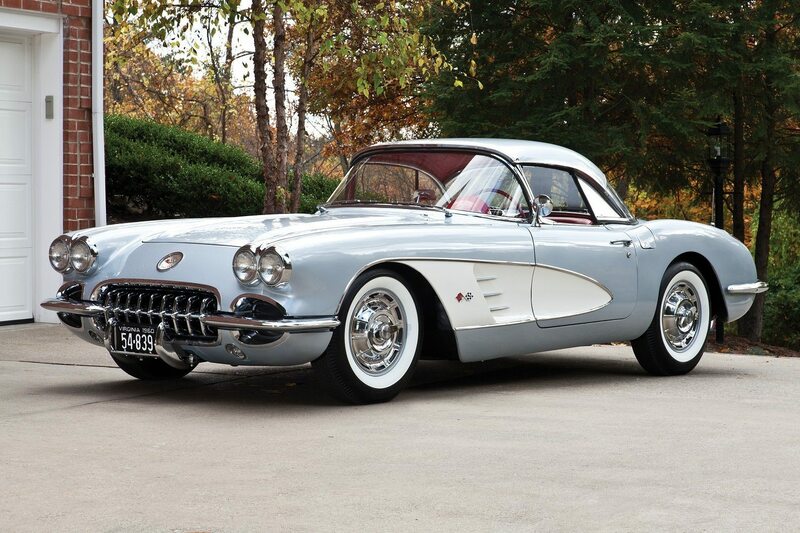 Although many Corvette enthusiasts believed the silver paint used on the bodyside coves to be Inca Silver, the actual color used on both the 1956 and 1957 Corvette was called Metallic Silver. A special, “racing only” camshaft that increased engine output (unofficially) to 240 HP. Was available only when combined with RPO 469 (the 265 Cubic Inch, 225 Horsepower Engine (with 2×4 Carburetors)). Chevrolet recommended this 449/469 combination “for racing purposes only”. A “high output” version of the standard 265 cubic inch engine. Chevrolet often referred to this upgrade as the addition of “dual four barrel carburetors” instead of recognizing it as a separate engine. Of the 3,080 Corvettes sold with this upgrade option, 1,510 were sold with manual transmissions, while 1,570 were sold with Powerglide automatic transmissions. Substitution of a beige or white soft top in place of the standard black convertible soft top. An optional rear axle gear ratio designed for quicker acceleration. Rear axle codes are located by the use of a stamp on the front right side of the differential carrier housing. The code will be followed by the month of manufacture, (1-12 or 01-12) and then the day of manufacture, (01-31). Although not listed as a factory option, there may also be a HT stamped, along with the gear ratio, which would stand for Hi-Tork used for Positraction Rear axles. These were rare and were only used on the 3.70:1 and 4.11:1 rear ends. Electronically controlled convertible top that could automatically raised/lowered. Unlike the 1953-1955 Corvette Roadsters, which had an optional top that could be attached to the car, this convertible top was an integral part of the design, allowing the 1956 Corvette to be identified as a true convertible. NOTE:Several of the options shown, including the Parking Brake Alarm, Courtesy Lights, Windshield Washers, RPO 469 Engines, and Power Operated Folding Tops were mandatory options early in the production year. Download these two 1956 Corvette Dealers Sales Brochure for a quick look at the features of the car.